Prof. Dr. Holger Simon ist Geschäftsführer der Pausanio GmbH & Co. KG. Pausanio ist die Agentur für digitale Kulturkommunikation. Pausanio berät Kultureinrichtungen und den öffentlichen Sektor bei der Entwicklung von Strategien für digitale Transformation, Content Marketing und Cultural Entrepreneurship. Zur Implementierung der Strategien programmiert sie entsprechende Software-Anwendungen wie Apps und Webseiten und produzieren audiovisuelle Medien. 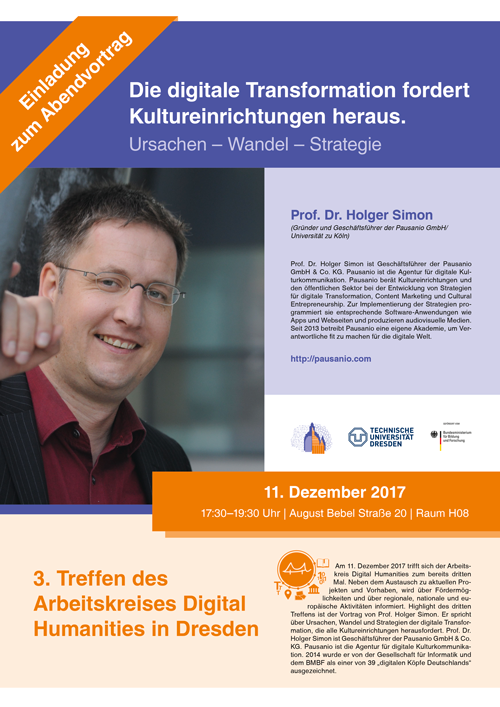 Seit 2013 betreibt Pausanio eine eigene Akademie, um Verantwortliche fit zu machen für die digitale Welt. Dubrovnik, Croatia. The aim of this scientific workshop is to compare and discuss methodologies of visualisation of the results achieved within the urban history research. The intention is to gather researchers from different disciplines, like art and architectural history, urban development studies, geographical history, economic, social and political history and archaeology, who would present their work. We are looking for papers dealing with the physical changes of urban tissue, its buildings or open spaces as well as those investigating the changes of the ways they were used, perceived or governed. The research could be based on archival data, literary sources, old maps and city views or examination of the physical realm. The visualisations of these results realised through analytic maps, especially those made with the use of GIS programs or improved with 3D models are most welcomed, as well as any other methodology applied. The discussion will be focused on possibilities, obstacles, limits and achievements of these methodologies in the improvement of understanding and dissemination of the research results. Barcelona, Spain. In 2017, EuroVis will be organized in Barcelona. Hosted by the ViRVIG Group of the Universitat Politécnica de Catalunya. This year will be the 19th edition. EuroVis is the annual Visualization Conference organized by the Eurographics Working Group on Data Visualization and supported by the IEEE Visualization and Graphics Technical Committee (IEEE VGTC). It has been a Eurographics and IEEE co-supported international visualization symposium held in Europe annually since 1999. Since 2012 EuroVis is a conference. The exciting and vibrant field of Visualization is an increasingly important research area due to its wide range of applications in many disciplines. In general, our ability to collect, store, and archive data vastly exceeds our ability derive useful knowledge and insight from it. This is a ubiquitous problem. Data visualization is key in gaining an understanding large, complex data sets by exploiting the human visual system. Data visualization leverages computer graphics in order to provide a visual overview, explore, analyze, and present phenomena which is often difficult to understand. The objective of the EuroVis conference is to create and strengthen connections between visualization researchers and practitioners, to foster collaborations, and to draw more researchers in Europe to enter this rapidly growing area of research. EuroVis has an expanded scope to include all areas of visualization, and a steadily more wide-spread visibility that allows to achieve a more wide-spread impact. NEW you can find the report of the conference here. Conference on Digital Encounters with Cultural Heritage is an international event for the professionals of multiple disciplines and scholars working in the Digital Cultural Heritage domain. The aim of the conference is to bring together experts, stakeholders and researchers from the cultural domain and, addressing the current challenges, start a dialogue that will lay the foundation for the creation of a multidisciplinary community of practice..
Urban history, drawing on architectural heritage and cultural history, is one of the key areas in digital humanities. Regarding to that research interest, digital libraries play an important role, especially for visual media like photographs, paintings, or drawings, but also for physical and virtual models. Due to the wide field of possible research, different approaches, methods and technologies have emerged – and are still emerging. Technische Universität Dresden, Deutschland. Vor dem Hintergrund beschleunigter Prozesse kultureller Transformation, aber auch ganz aktueller Debatten über Kulturgutverlagerung und das Erleben von Kulturgutver­nich­tung haben es sich der Verband Deutscher Kunsthistoriker e. V. und das Institut für Kunst- und Musikwissenschaft der Technischen Universität Dresden als gemeinsame Veranstalter des nächsten Kunsthistorikertages zur Aufgabe gemacht, unter dem Motto „Kunst lokal – Kunst global“ Fragen nach dem Spannungsfeld von Lokalität und Globa­li­tät in den Mittelpunkt der wissenschaftlichen und fachpolitischen Diskussion zu stel­len. Universität Bern, Schweiz. Der Verband „Digital Humanities im deutschsprachigen Raum (DHd) e. V.“ lädt zur vierten Jahrestagung seit seiner Gründung. Organisiert von Prof. Dr. Tara Andrews (Digital Humanities, Walter Benjamin Kolleg) und Prof. Dr. Thomas Myrach (Institut für Wirtschaftsinformatik) findet diese Tagung vom 13. bis 18. Februar 2017 an der Universität Bern unter dem Leitthema “Digitale Nachhaltigkeit” statt.